It may be rather obvious to some, but ‘SUV’ is an acronym for ‘sport utility vehicle.’ Often times, brands will simply produce hulking, roomy vehicles, completely ignoring the ‘sportiness’ that these rides should be delivering. Fortunately, that isn’t the case for the 2016 Chevy Tahoe. The SUV provides all of the athletic attributes a customer should expect from this type of ride: a powerful engine, reliable mechanics, and a muscular style. Of course, the brand wasn’t going to stop there, as engineers also added several features that are occasionally absent from this segment, especially technology. To some extent, the Chevy Tahoe is helping to reinvent the SUV segment due to the inclusion of technological, comfort, and convenience features. However, when it comes down to it, the vehicle ultimately delivers all of the factors that we should expect from an SUV. The 2016 Chevy Tahoe’s engineers are truly trying to accentuate the “sport” in sports utility vehicle. The incredible EcoTec3 engine provides robust power, with the 300-plus horsepower and torque rivaling some of the best specs in the class. Best of all, a number of technological inclusions will help improve the vehicle’s efficiency, so drivers won’t have to dish out tons of money to continue navigating their beast-like SUVs. The engine’s accompanying mechanics are just as capable as the engine. The flexible suspension system improves efficiency, and it also plays a role in SUV’s incredible towing capacity! Customers are presumably pursuing an SUV for its sportiness. Well, there’s no denying that the Chevy Tahoe delivers in that regard. Power and efficiency. Sure, you may find that those attributes are present in the engines of much more expensive rides. On the flip side, you rarely see these two factors included in, say, an SUV. Fortunately, that sentiment doesn’t really apply to the powerful and efficient 5.3-liter EcoTec3 V8 engine included in the 2016 Chevy Tahoe. This engine offers incredible power specs, pumping out 355 horsepower and 383 pounds-feet of torque. Luckily, these numbers don’t compromise the overall efficiency of the unit. Thanks to technologies like Direct Injection, Variable Valve Timing, and Active Fuel Management, drivers can expect the V8 engine to deliver a 23 mile per gallon highway fuel efficiency. You shouldn’t only expect power and efficiency from your 2016 Tahoe’s mechanics. The unit also offers an excellent, light-weight suspension system. This unit plays a significant role in helping improve the SUV’s overall fuel efficiency, but it also impacts the towing capacity. Driver’s can anticipate an 8,600-pound towing capability from their 2016 Tahoe, making the SUV a surprisingly logical choice for road trips or the worksite. Owners should be able to haul boats, trailers, work equipment… whatever cargo they see fit. Once upon a time, innovative technology was often reserved for luxury vehicles. Nowadays, you’ll see a number of technological features included in even the most affordable vehicles. Therefore, it shouldn’t be much of a surprise that the 2016 Chevy Tahoe is chock full of technological amenities. It starts with the brand’s MyLink infotainment system, and it continues on to the 13 charging locations and the push-button start. This technology isn’t reserved for the interior; there are a number of safety technologies lingering behind the scenes. These features will help prevent accidents, and they’ll keep passengers protected in the event of an emergency. Sure, as a potential car buyer, you may not prioritize the technology featured in your targeted vehicles. However, considering all of the innovations the Tahoe has to offer, the technology is certainly worth reviewing. Similar to most of Chevy’s vehicles, the technological amenities are led by the innovative Chevrolet MyLink infotainment system. The eight-inch color touch-screen allows drivers to access a number of functions, and thanks to the Apple CarPlay technology, drivers can seamlessly link their iPhones to the system. This means drivers can make hands-free phone calls and enjoy their favorite musical playlists. Meanwhile, drivers can keep that smartphone charged thanks to the incredible 13 charging locations found throughout the interior. This includes six USB ports, a three-prong outlet, and even a wireless charging dock. Needless to say, your passengers will never be arguing over who gets to charge their phone next. Finally, the various push-buttons allow you to unlock your door or operate your engine with a simple click. That technology isn’t exclusive to the Tahoe’s interior, as the SUV also offers an assortment of innovative safety features. Technologies like Side Blind Zone Alert will notify the driver when another vehicle has crept up beside them, while the Lane Keep Assist and Front Park Assist will actually manipulate your vehicle for maximum safety. If you do find yourself in an accident, there’s no reason to fret. Passengers are surrounded by a high-strength steel cage, and the body should absorb the energy caused by impact. The seven airbags should provide the necessary amount of cushion, and the OnStar Automatic Crash Response System means emergency personnel can be dispatched as soon as possible. There’s a good reason why Chevy’s group of SUVs continue to lead the industry in sales. Sure, the technological and performance capabilities are certainly appreciated, but we’d be fooling ourselves if we ignored one of the Tahoe’s most beloved attributes: its style. The exterior has been chiseled to help hammer home the sportiness of the SUV, and several exterior convenience features improve the overall driving experience. Meanwhile, the interior is highlighted by a number of luxury materials, as well as an abundance of storage space. This isn’t an attempt to discount the other aspects of the Chevy Tahoe, but when it comes down to it, there’s no denying that the nameplate is the most stylish SUV in the class. The Tahoe’s interior is adorned with a number of high-class materials and upholsteries, adding a rather luxurious feel to your new SUV. The soft leather seats will provide maximum comfort, and passengers can also admire the wood trim. Predictably, the Tahoe’s interior offers a whole lot more than luxury and style. Drivers will appreciate the 94.7-cubic-feet of cargo space, allowing them to fit any of their luggage or equipment. For additional space, drivers can access the hidden lockable compartment behind the eight-inch touchscreen. Best of all, the acoustic-laminated windshield and the triple-sealed inlaid doors help reduce cabin noise. That way, drivers won’t be distracted by the gusting wind or a howling engine. There’s no denying the exterior style of the 2016 Tahoe, as the SUV’s sculpted body certainly drives home the nameplate’s athleticism. The bright front lights and large grille will have other drivers gawking, while the chiseled angles may make others intimidated. Of course, the available 22-inch wheels will also have everyone admiring your new ride. The exterior also offers several convenience features, making the driver’s life a whole lot easier. For example, the automatic liftgate will open when an owner has approached the rear sensors, making for maximum loading and unloading convenience. This means drivers don’t have to fumble with their keys as they attempt to juggle all of their groceries. You’d be hard-pressed to find a sportier ride than the 2016 Chevy Tahoe, not to mention a better buying experience than at McCluskey Chevrolet. The Cincinnati, Ohio dealership offers an array of new and used Chevy vehicles, and the business also promises some of the best (and most transparent) prices in the area. McCluskey isn’t solely focused on selling cars. The dealership’s finance department is focused on keeping the customer out of financial turmoil, while the service department will help your new Chevy continue to operate like it’s brand new. 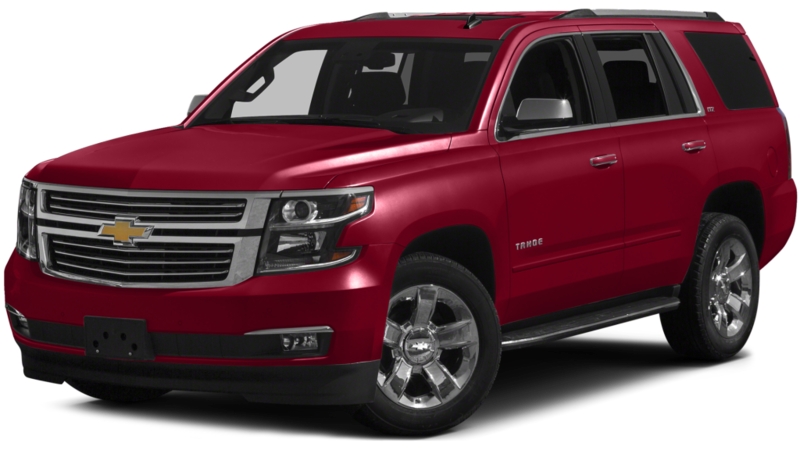 You presumably want to immediately enjoy all the 2016 Chevy Tahoe has to offer. Well, instead of being bogged down by a lengthy purchase process, drivers can simply visit McCluskey for the best possible car-buying experience.